The Civil War shaped the friendship of West Point roommates George Armstrong Custer of the Union Army and Thomas L. Rosser, Sr, of the Confederate Army, and continued to impact their lives after the Civil War. On opposite sides in the Civil War, General Custer and General Rosser created and crossed cavalry paths, often fighting in the same battles, and occasionally encountering each other face to face. Both were dashing Cavalry officers and their contemporaries often compared them to each other. General George McClellan and others that he served under described George Armstrong Custer as shrewd, analytical, calm under pressure, brilliant, intelligent, and ambitious. Others called him gallant, and still others called him reckless. The two cavalry officers were present at the first and last battles of the Civil War. Both traveled West in search of career advancement, and met again during the Indian Wars in Montana and both cavalrymen forged controversial careers, with Custer commanding the 7th Cavalry and General Rosser serving in the Spanish American War. Their deaths were also a study in contrast. General Custer’s life ended in the Indian Wars at the Little Big Horn on June 25, 1876, while General Rosser died in Virginia on March 29, 1910. Born in New Rumely, Ohio, on December 5, 1839, George Armstrong Custer, or Autie as he pronounced his middle name as a child, was the son of Emanuel Henry Custer, a farmer and blacksmith, and Marie Ward Kirkpatrick Custer. He had two younger brothers, Thomas and Boston, a sister, Margaret, a brother Nevil, and several older half-brothers and sisters from his mother’s side of the family. His half-sister Lydia Ann, 14 years older, served as his surrogate mother when Marie Custer died, and they were as close as mother and son. They were so close that after Lydia Ann married David Reed and moved to Monroe, she urged her father to send Autie to Monroe to take advantage of the good schools not found in New Rumley. At age 14, Autie came to Monroe to live with the Reeds and attended the New Dublin School, returning to Ohio to spend the summers. Autie didn’t take school seriously, finding it more fun to play practical jokes and fish in the River Raisin with the other boys. He did meet one girl who would play an important role in his life. The story goes that one day while Libbie Bacon, the daughter of Judge Daniel S.Bacon who lived on Main Street, was swinging on her front yard gate, she saw him run by and shouted a hello. Then overcome by shyness, she ran into her house. In 1856, Autie graduated from McNeely Normal School (Hopedale Normal or teacher’s College) by a blonde whisker, and he taught school in Cadiz, Ohio for a time. Deciding that teaching school didn’t excite him, he applied to the U.S. Military Academy at West Point, New York and with the help of influential friends he gained admission as a cadet in the class of 1862. Both Autie Custer and his Texan roommate Thomas Lafayette Rosser excelled in horsemanship and cavalry training, but most of the required subjects didn’t interest or inspire Autie Custer and he collected demerits and poor grades. He graduated last in his class of 34 cadets on June 24, 1861, as a second lieutenant. Thomas Lafayette (Tex) Rosser, was born on October 15, 1836, the son of John and Martha Melvina Johnson Rosser, at Catalpa Hill, a farm in Campbell County Virginia. When Thomas was 13, his family moved to a 640-acre farm in Panola County, Texas. John had to stay behind in Virginia to wrap up some business affairs, so Thomas led a wagon train carrying his mother and younger brothers and sisters to their new farm, about forty miles west of Shreveport, Louisiana. Thomas continued his education in Texas and did well enough for Texas Congressman Lemuel D. Evans to appoint him to West Point, the United States Military Academy, in 1856. Committing himself to the West Point program, Thomas settled in with his roommate, George Armstrong Custer and they soon became friends as well as roommates. Although Thomas completed his course of studies at West Point, he resigned two weeks before his June graduation date because his adopted state of Texas had seceded from the Union on February 1, and joined the Confederacy on March 2, 1861. The “reckless gallant boy” captured the first Confederate battle flag of the Civil War while successfully leading an attack with four companies of the 4th Michigan Infantry across the Chickahominy River above New Bridge in May 1862. He fought in the Maryland Campaign in September and October 1862, participating in the Battles of South Mountain, Antietam, and the March to Warrenton, Virginia. In 1863, serving as an aide to Brevet Lieutenant Colonel Alfred Pleasonton, commander of the Cavalry Corps, Army of the Potomac, Custer participated in the movement to located General Lee in the Shenandoah Valley which would soon be known as the Gettysburg Campaign. General Pleasanton promoted George Armstrong Custer to brigadier general of volunteers, commanding the Michigan Cavalry Brigade of Wolverines, making him at age 23, one of the youngest generals in the Union Army. Brigadier General Custer played an important role in the Battle of Gettysburg’s third day cavalry battles. On July 3, 1863, two cavalry battles took place- one happened about three miles east of what came to known as East Cavalry field and the other occurred southwest of the Big Round Top Mountain, sometimes called South Cavalry Field. At the East Cavalry Field, Major General J.E.B. Stuart’s Confederate cavalry attempted to reach the Federal rear and take advantage of any opening that Pickett’s Charge created. The Union Cavalry under Brigadier General David McM Gregg and Brigadier General George Armstrong Custer halted the Confederate advances. In 1864, Major General Philip Sheridan reorganized the Cavalry Corps of the Army of the Potomac, and General Custer who now commanded the 3rd Division, and his Wolverines operated in the Shenandoah Valley. In May and June, General Sheridan and Brevet Lieutenant Colonel Custer took part in the Overland Campaign which included the Battle of the Wilderness, Battle of Yellow Tavern, and the Battle of Trevilian Station. By the end of 1864, they had defeated Confederate Lieutenant General Jubal Early’s army in the Valley Campaigns of 1864. After defeating Confederate commander General Jubal Early, Generals Custer and Sheridan made their way back to the main Union Army lines at Petersburg to join the Union siege of that city and spent the winter there. In April 1865, General Robert E. Lee began his retreat to Appomattox Court House, with the Union Cavalry close behind. General Custer’s division blocked General Lee’s retreat in its final days and the Confederates gave Custer and his men the first flag of truce. Custer witnessed the Confederate surrender at Appomattox Court House and General Philip Sheridan gave General Custer the table that the Confederates used to sign the surrender as a gift to his wife, a gift which included a note praising Custer’s gallantry. In June 1861, Thomas Lafayette Rosser resigned from West Point and traveled to Alabama to join the Confederate Army. He began the war as an instructor for the Washington Artillery in New Orleans and commanded the Second Battery of the Washington Artillery in the First Battle of Manassas. At Manassas, he shot down a Union observation balloon, earning a promotion to captain for his actions. On June 26, 1862, Captain Rosser was wounded at the Battle of Mechanicsville, but he recovered and received a promotion to colonel of the 5th Virginia Cavalry. In August of 1862, he commanded the advance of Jeb Stuart’s expedition to Catlett’s Station and he participated in the Second Battle of Bull Run fought on August 28-30, 1862. At the Second Bull Run, Colonel Rosser captured the orderly and horses of Union commander John Pope. In September 1862, Colonel Rosser fought at the Battle of South Mountain where his Cavalry and John Pelham’s artillery delayed the Union advance. At Antietam, Colonel Rosser and his men protected Robert E. Lee’s left flank and in March 1863 at the Battle of Kelly’s Ford, Colonel Rosser again was wounded. After the Battle of Gettysburg, Colonel Rosser received a promotion as brigadier general of the “Laurel Brigade,” and participated in the Battle of the Wilderness from May 5-7, 1864. He was wounded again in June 1864 at Trevilian Station, a major cavalry battle, and in November 1864, he was promoted to major general for distinguished service in the Shenandoah Valley. In January 1865, he and his men raided New Creek, West Virginia, seizing a many prisoners and supplies. During the June 1864 to March 25, 1865 Siege of Petersburg he commanded a cavalry division and he and his men participated in the Appomattox Campaign of March 29- April 9, 1865. He and his command evaded the Union troops at Appomattox, but Major General Rosser and his men were captured on May 4, 1865, near Staunton, Virginia. They met at Buckland Mills, Trevilian Station, Tom’s Brook, Gettysburg, and finally, Appomattox. General Rosser allowed his former college roommate to cross the creek, and then invaded the campsite while the Union troops brewed coffee. It took General Custer a day to collect his scattered men. At Trevillian Station, on June 11-12-, 1864, General Rosser was again wounded, but his brigade captured many prisoners and an ambrotype of Libbie Custer from his former West Point classmate and friend, George Armstrong Custer. Both Generals Custer and Rosser participated in the Shenandoah valley campaigns, and each equaled each other in bravery and bravado. Elizabeth Bacon Custer was born April 8, 1842 in Monroe, Michigan, the daughter of Judge Daniel Stanton Bacon and Eleanor Sophia Page Bacon. Elizabeth “Libbie” Bacon experienced much tragedy in her young life. Her brother Edward died in 1848 while still a baby. Her two younger sisters died at only one year old, Sophia living from 1845-1846 and Harriet living from 1848-1849. Then Libbie’s mother, Eleanor died in 1854 when Libbie was only twelve years old. Sorrow drew Libbie and her father Daniel closer and he was protective of her. One of the first times that Autie Custer saw Libbie Bacon, she was swinging on her gate and she ran after him shouting a hello. Autie formally met Libbie Bacon at a Thanksgiving party at Boyd’s Seminary, a Monroe school. By this time, Libbie had grown into a stylish and beautiful young woman, intelligent and accomplished. She spoke French and wrote well, and could converse fluently with her many suitors. Autie fell immediately in love, but winning Libbie and her father over proved to be a challenge. Rumor had it that Libbie hadn’t been overly impressed with Autie Custer at their first meeting, and Judge Bacon was one of Monroe’s leading citizens compared to Autie’s father, Emanuel Henry Custer, a blacksmith. As George Armstrong Custer continued to win battlefield fame and promotions, Libbie and her father Daniel increasing approved of him. Fourteen months after they formally met, George Armstrong Custer and Elizabeth Clift Bacon were married on February 9, 1864 in the First Presbyterian Church of Monroe. For their honeymoon, Libbie followed her husband to the front lines because she didn’t want to be separated from “her Autie.” Libbie wrote books about her experiences following her husband on his campaign trails. Elizabeth Barbara “Betty” Winston Rosser, was born March 6, 1844 in Hanover County, Virginia. She, too, married her husband, Thomas Lafayette Rosser, during the Civil War. The Rossers had six children: Sarah Overton Rosser Cochran, Thomas Lafayette Rosser, Jr., William Winston Rosser, John Pelham Rosser, Elizabeth Florence Rosser and Marguerite Rosser Eliott. Judging by her ideas and recipes that she published in a mother’s manual that she wrote in later years, Betty Rosser accompanied her husband on many of his military assignments while caring for her growing family. George Armstrong Custer remained a major general in The United States Volunteers until they mustered out in February 1866. In May 1866, he and Libbie returned to Monroe and he threw himself into peacetime concerns. He thought about running for Congress. He added his ideas to the public debate over how to treat the American South after the Civil War, arguing on the side of moderation. He didn’t join the Grand Army of the Republic which had a reputation of being overly partisan. Instead, he headed the Soldiers and Sailors Union, considered more moderate. In July 1866, General Custer was appointed as a Lieutenant Colonel in the 7th Cavalry Regiment. In September 1866, Colonel Custer and his wife Libbie accompanied President Andrew Johnson on a train journey called “Swing Around the Circle”, with the goal of winning public support for President Johnson’s Southern policies. Lieutenant Colonel Custer denied newspaper charges that President Johnson had promised him a colonel’s commission in return for his support. From October 18, 1866 to March 26, 1867, Colonel Custer served on frontier duty at Fort Riley, Kansas and he scouted in Kansas and Colorado until July 1867, and then he participated in Major General Winfield Scott Hancock’s Cheyenne Expedition. After the Hancock campaign, Lt. Colonel Custer was arrested and suspended to a year at Fort Leavenworth, Kansas for abandoning his post to visit his wife. Since Major General Philip Sheridan wanted Custer for his winter campaign against the Cheyenne, he returned to duty before his one-year suspension had expired, rejoining his regiment on October 7, 1868. He spent the next year on frontier duty, scouting in Kansas and Indian Territory, establishing Camp Supply in Indian Territory to use as a supply base for General Sheridan’s winter campaign. On November 27, 1868, he led the 7th Cavalry Regiment in attacking the Cheyenne encampment of Chief Black Kettle at what was called the Battle of Washita River, named the first substantial United States Army victory in the Southern Plains War and instrumental in forcing much of the Southern Cheyenne onto reservations. In 1873, the United States Army sent Lt. Colonel Custer to Dakota Territory to protect a railroad survey party from the Lakota, and the Seventh Cavalry fought the Lakota for the first time on August 4, 1873, near the Tongue River. In 1874, Custer led an expedition to the Black Hills and announced the discovery of gold, creating the Black Hills Gold Rush. After Appomattox, Major General Thomas Lafayette Rosser didn’t have as many options as his West Point roommate George Armstrong Custer. He unsuccessfully tried various jobs and business endeavors until 1869, and then like so many other people seeking to rebuild their lives after the Civil War, he headed west. He found a position with the National Express Company and quickly worked himself up to superintendent. Later General Rosser became the chief engineer of the Northern Pacific and Canadian Pacific Railroads. “Why I have been looking for such a man,” the engineer said. And so Rosser, through Custer’s kindly offices was made second in command of the engineer corps. When a few months later he became the Chief, he made such shrewd use of the opportunity the position afforded him for speculation and investment that today he is easily worth a half a million dollars. General Rosser had enough drive and ambition to gain a toehold in the railroad industry through his own efforts. Establishing himself in the railroad growth industry of the mid-nineteenth seemed a natural next step in his career. Building railways across the vast prairies and steep mountains of the west offered as much travel, adventure, and challenges as navigating Gettysburg and galloping on to Appomattox. Thomas Lafayette Rosser proved to be as skilled a railroad man as he had been a cavalryman, working his way up from the beginning bottom to roadman, scout, chief surveyor and soon, Chief Engineer of the Northern Pacific Railway. His choosing of the crossing of the Red River at Fargo, North Dakota, and the land speculation profits he is supposed to have made, was the beginning of the personal fortune he had worked so long and hard to accumulate. As General Rosser supervised the surveying of the Northern Pacific Railroad line west through Montana, the Native Americans watched the instillation of the shining rails with resolve to protect their homeland as hard as the rails. When the Native Americans began to attack, General Rosser fought back, carrying a rifle, a brace of pistols, and saddle bags full of ammunition when traveling the line. Eventually, he enlisted the help of the United States Army, reinforcing the tradition of collaboration between the military and the major Nineteenth Century corporations, the railroads, and reconnecting with his old friend General George Armstrong Custer. When General Custer and his 7th Cavalry stepped in to protect the building of the Northern Pacific Railroad circa 1873, he and General Rosser reunited at some point. Their meeting in a camp on the Northern Pacific line must have been as much of a reunion between old friends as a military operation to protect the railroad from the Sioux. The air around the evening campfire of the two generals probably resounded reminiscences of the cavalry campaigns of the Shenandoah Valley and events after Appomattox. The two generals, former roommates, former enemies, worked together to ensure that the shining railroad ties would reach all the way to the Pacific Ocean. In June 1876, along with the rest of the United States, General Rosser struggled to absorb the tidings of June 25-26, 1876. His friend General George Armstrong Custer and 268 of his 7th Cavalry men had been killed with 55 wounded, near the Little Bighorn River in eastern Montana Territory. General Custer’s two brothers, a brother-in-law, and a nephew were also counted among the dead. In the midst of mourning his old friend, General Rosser felt impelled to counter the attacks against General Custer ranging from Ulysses S. Grant, the United States President to some of his own relatives. General Rosser wrote a letter to the Chicago Tribune, blaming the disaster at the Little Big Horn on Custer’s subordinates, especially Major Marcus Reno. General Rosser said: “ I feel that Custer would have succeeded had Reno with all the reserve of seven companies passed through and joined Custer after the first repulse. I think it quite certain that General Custer had agreed with Reno upon a place of junction in case of a repulse of either or both of the detachments, and instead of an effort being made by Reno for such a junction as soon as he encountered heavy resistance he took refuge in the hills, and abandoned Custer and his gallant comrades to their fate. Major Reno’s threat of a lawsuit forced General Rosser to retract his attack on the Major’s part in the Battle of the Little Bighorn, but General Rosser had used his military skill to highlight the controversy surrounding the demise of General Custer and his men. After the death of General Custer at the Little Big Horn, General Rosser moved on to survive some controversies of his own making. In the spring of 1881, his stint as chief engineer on the Northern Pacific Railroad led to a position as a trouble shooter and problem solver on the portion of the Canadian Pacific Railroad north of the border, partially became of his connections and influence in the railroad sector. General Rosser had worked through creating a railroad problems with the Northern Pacific, being responsible for selecting town sites and crossings, so he seemed to be a good choice for the fledgling Canadian Pacific Railroad. In May of 1881, General Rosser and his boss, Alpheus B. Stickney’s men turned prairie sod near Portage La Prairie to open the season of creating new towns to support their railroad and new settlement. General Rosser and Alpheus Stickney soon discovered that creating new towns could be worth reported profits of $130,000 between them during their brief careers with the Canadian Pacific Railroad. General Rosser was believed to have altered the preliminary survey of the line in Saskatchewan to bring it through Regina where he had money invested. The local press, especially in the places where Canadian Pacific Railroad decisions dashed hopes of profitable speculation, extensively and thoroughly reported the activities of General Rosser and Alpheus B. Stickney and the money they were making. The in depth reporting ended General Rosser and Alpheus Stickney’s careers as railway entrepreneurs. William Cornelius Van Horne replaced Alpheus Stickney and one of his first actions was sending a telegram to General Rosser, announcing that he was fired. General Rosser declined to be fired, and left town on urgent business. Cornelius Van Horne persisted, and eventually General Rosser sued for malicious prosecution, asking for $100,000 and ending up with a settlement of $2,600. Returning to Charlottesville, Virginia, General Rosser farmed and experimented with a succession of business ventures that never seemed to get off the ground. By the 1890s, General Rosser had earned the distinction of “prominent living Civil War Veteran” and American Patriot. In 1898, he was a trainer of recruits for the Spanish American War, drilling young cavalry recruits in a camp near the old Civil War battlefield at Chickamauga in northern Georgia. Honorably discharged on October 31, 1898, he again returned home to Virginia. When he died on March 29, 1910, he was Postmaster of Charlottesville, Virginia. He is buried in Riverview Cemetery in Charlottesville, Virginia. After his death at the Battle of the Little Big Horn, General George Armstrong Custer became more famous that he had been during the Civil War. His wife Libbie had gone with him on many of his frontier expeditions and she published several books about him, including Boots and Saddles, Tenting on the Plains, and Following the Guidon. She characterized her husband as a tragic military hero who sacrificed his life for his country, and for the most part, the public saw his life the same way. President Theodore Roosevelt lavished praise on General Custer, which pleased his widow. Others disagreed with General Custer’s actions, including President Ulysses S. Grant, who said in the New York Herald that he considered the massacre “unnecessary.” General Phillip Sheridan also criticized his general’s last military actions. His legacy is controversial into the 21st Century. In Canada, General Rosser has a mostly unrecognized legacy. In the crucial summer of 1881 he shaped Canadian settlement patterns and created towns, and facilitated the expansion of the Canadian Pacific Railroad. Even though he had a financial interest, he pushed the rails westward and helped Canada grow and prosper. In the United States, he is remembered in Civil War history as an excellent Confederate cavalry soldier, but more often he is recalled as the roommate and friend of General Custer. After the Little Big Horn, Libbie Custer, her sister-in-law Margaret and the other widows sold what possessions they could, packed a few cherished items, and made the long journey back east. Libbie returned to Monroe and stayed with Erasmus Boyd, her former school principal. Although reporters besieged her, she remained in seclusion for a time, but eventually she began a campaign of her own that made her husband more famous that any of his exploits as a cavalryman. Remaining a widow, Libbie Custer wrote several books about her life with her famous husband, including Boots and Saddles, Life with General Custer in Dakota; Tenting on the Plains; and Following the Guidon. She traveled the world, writing and lecturing about her husband, portraying him as a hero and an example of courage, leadership, and patriotism for American boys. Because of her efforts, this image of her husband remained firmly in place for nearly fifty years. Libbie lived to be 90 years old. She died in New York City on April 4, 1933 and she is buried beside her husband at West Point. In 1895, Mrs. Thomas L. Rosser wrote and published the Housekeepers’ and Mother’s Manual. In the preface of her book she explains her attitude toward her husband and home and hints at the nomadic nature of her life with General Rosser, a life resembling Libbie Custer’s travels with her husband. In compiling and writing " The Housekeepers' and Mothers' Manual " I have done so in the face of many contingencies, and the knowledge that there are already many excellent cookery books published ; and in addition to the cookery books, cooking schools giving advantages in that department of house hold work unknown thirty years ago. Cooking schools, while a long-felt need and of inestimable benefit and help to those who enjoy the opportunity of attending, can never be as far-reaching as a good cookery book or housekeepers' and mothers manual, nor can they have an abiding place upon the pantry shelf as a friend in need— an ever-present, ready, reliable reference, giving, as it were, heart to heart advice, help and explanation in the various methods of domestic work, and cannot meet the multitudinous needs of a family covering the " Seven Ages of Man," catering to the appetites of the sick and infirm, as well as giving aid and succor to the well, by appeasing hunger and thirst ; giving hundreds of reliable hints for the household, and many remedies for relieving ailments of all kinds ; inestimable advice and suggestions about the nursery, the sick room and the dairy, as well as all other departments found in a well-organized house and home ; and as such a friend I have tried, after thirty years' experience in housekeeping in the North, South, East and West, to make this book. The burning question of the day in America has never been of wars or rumors of wars ; the political situation—tariff reform, the unifying of gold and silver, the deportation of John Chinaman, nor woman suffrage —but " women as cooks." This is the momentous question that, through the appetites, appeals to the hearts of the millions of Americans for " civilized man cannot live without cooks, especially when good meals lubricate business as well as ensure health, happiness, and sobriety. On June 4, 1910, Libbie Custer stood with President William Howard Taft when the equestrian bronze sculpture of her husband titled “Sighting the Enemy,” by Edward Clark Potter was dedicated in downtown Monroe. Over the years, it has been moved three times and it now stands at the southwest corner of Elm Avenue and North Monroe Street near the River Raisin. Custer’s sister Margaret married James Calhoun who died at the Little Big Horn. She is buried in Woodland Cemetery in Monroe along with David and Lydia Ann Reed and George Armstrong Reed, and Boston Custer. 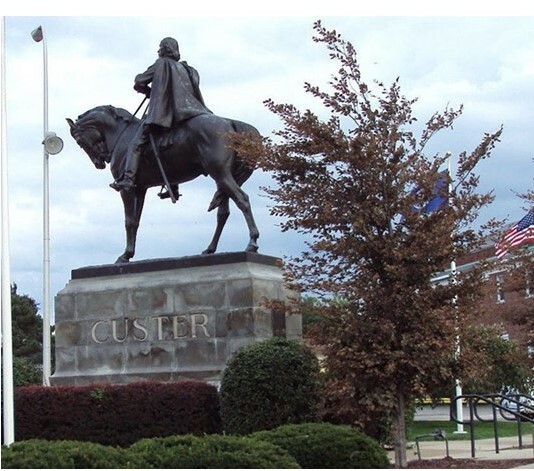 Thomas Custer is buried at the Ft. Leavenworth National Cemetery, Ft. Leavenworth, Kansas and so is James Calhoun. General Custer is buried at West Point. Libbie’s parents are buried near the entrance to Woodland Cemetery. T. O. Beane, Thomas Lafayette Rosser, Soldier, Railroad Builder, Politician, Businessman (1836 - 1910). MA Thesis, University of Virginia, 1957, 23 . Jeffry D. Wert, Custer: The Controversial Life of George Armstrong Custer. New York: Simon & Schuster, 1996, p. 15. George B. McClellan. McLellan’s Own Story: The War for the Union. New York, Charles L. Webster, 1887, p. 365. Mount Up – Cavalry Operations of the Gettysburg Campaign. Gregory J.W. Urwin, Custer Victorious, the Civil War Battles of General George Armstrong Custer. University of Nebraska Press, 1990. Brooklyn Daily Eagle Sunday July 17, 1898, Famous Generals, p. 30. (7] Riding with Rosser: Memoirs of Gen. Thomas L. Rosser, C.S.A., Shippensburg, Pennsylvania: Burd Street Press, 1997. Louise Barnett, Touched by Fire: The Life, Death, and Afterlife of George Armstrong Custer. New York: Henry Holt and Company, Inc. p. 22. Riding with Rosser: Memoirs of Gen. Thomas L. Rosser, C.S.A., Shippensburg, Pennsylvania: Burd Street Press, 1997. General Rosser’s Legacy, by Ken Storie, Gimli, Manitoba. Manitoba History, Number 56, October 2007.